Travel for extended periods without having to dock for freshwater refills. Make your own water anywhere. Dometic Sea Xchange SE watermakers provide recreational boaters with the luxury of creating their own water while cruising the ocean. The extremely compact SE series produces 350 GPD (1,325 LPD) to 800 GPD (3,028 LPD) using reverse-osmosis technology to turn seawater into potable water. SE series watermakers fit anywhere. The 2-in-1 modular or compact frame lets you make the best of any available installation space. 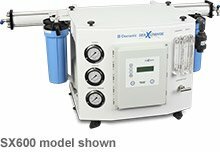 Dometic Sea Xchange SX watermakers use reverse osmosis to turn seawater into fresh, drinkable water. Keep your water tanks filled to capacity without having to load and transport extra water supplies. Four SX models are offered with capacities ranging from 600 GPD (2,271 LPD) to 2,200 GPD (8,328 LPD). Built with high-quality components, including high-rejection seawater membranes, a compact Sea Xchange system takes up minimal space on-board and is designed for continuous high performance. Dometic Sea Xchange XTC watermakers let you enjoy the freedom of fully automatic operation with the backup reliability of mechanical override for full redundancy and peace of mind. 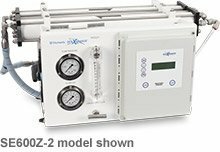 XTC watermakers produce from 600 GPD (2,271 LPD) to 2,200 GPD (8,328 LPD) of potable water. Operation is easy and dependable. The built-in 7 in. color touchscreen display with a marine-ready enclosure meets the National Electrical Manufacturers Association (NEMA) 4x rating, which ensures resistance to corrosion, water, windblown dust, and external ice formation. Its color graphics are easy to read and understand. Another unique, innovative advantage–the XTC series provides remote access via smartphone, tablet, or computer from anywhere in the world using Dometic’s embedded Smart Touch Integrated Intelligence Control (STIIC) software. XTC watermakers have mechanical override in case of computerized automation failure.